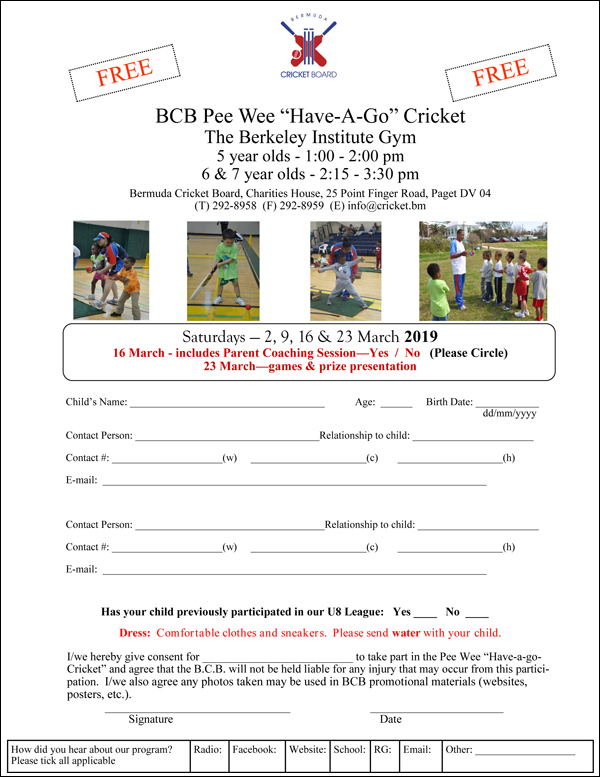 Registration for the free Bermuda Cricket Board Pee Wee ‘Have-a-go’ Cricket Program for children ages 5 – 7 opened today. The program takes place at Berkeley Institute Gym Saturday 2nd March and runs every Saturday finishing on 23rd March. During the sessions, the players will be introduced to the basics of cricket with the main aim of having fun. Utilizing the “Have-a-go” Cricket equipment, coaches will work with the players on learning the basics skills of catching, bowling and batting with the aim of playing a game in the last session against the parents. On March 16th, the BCB is offering an additional session for the parents to learn fun skills and drills, which they play with their children at home. On the last day parents and their children will participate in a parent/child game followed by a short prize presentation. Mr. Lloyd Smith, President of the BCB stated, “The Pee Wee Cricket program is the foundation of our Youth Development Program, which introduces the game of cricket in a fun, structured and safe environment to 5-7 year olds.